One of the first things that all first year law students are taught is that as a lawyer, you don't get to pick your judge. That is called forum shopping and is a "big no-no." Perhaps the judge assigned to your case is inexperienced or is viewed by your lawyer as a judge who is just... not that good. 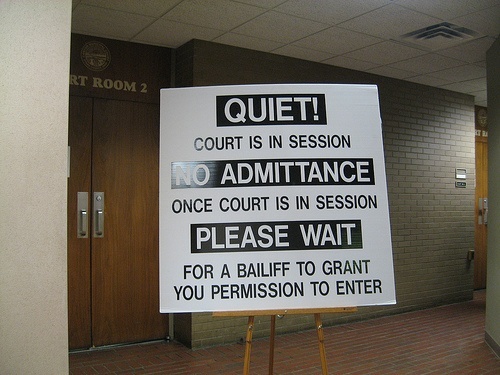 As I have stated before, some judges are just not comfortable being Family Court judges. There are many reasons that forum shopping is not allowed. Suffice it to say, if your divorce case is proceeding in a New Jersey divorce court, you will not get to pick your judge. The judge will be assigned to you by the system. Halfway through your case, the system may change judges and the judge that you started out with may not be the judge who actually tries your case. This is just the way that it is. What can you do, then, if you are dissatisfied with the judge that is assigned to your New Jersey divorce case and you do not want that person making major decisions that will affect your life and the lives of your children? Mediation is a system where you and your spouse work with a neutral professional (the mediator) to negotiate a fair and reasonable settlement that is acceptable to the two of you. Arbitration is a system where two parties to a divorce can choose to hire a lawyer to serve as an arbitrator. Parties electing this option are essentially choosing their own "judge," in the sense that arbitration is similar although not identical to a courtroom battle. By choosing arbitration, your lawyer and your spouse’s lawyer have the opportunity to agree essentially upon who the arbitrator (i.e., essentially a judge that you choose) will be in your particular case. In divorce arbitration, both sides are sworn to tell the truth just as in a court trial. Both sides appear with their lawyers at the arbitrator’s office as opposed to the county courthouse. Testimony is taken. Evidence is offered to the arbitrator. And after the arbitrator hears all of the testimony and considers all of the evidence, the arbitrator will enter a written decision that is binding upon the parties, just as if the decision were made by a New Jersey Family Court Judge. Additionally, arbitration can often be done much quicker than litigation in the Family Court. This is because when you hire an arbitrator with your spouse, your lawyers and your arbitrator can set the arbitration schedule as opposed to waiting for the court system to work its way through the many cases that are older than your case before your case can get a realistic trial date. In my law practice, 99% of my cases are settled and only about 1% need to be decided by a neutral third-party. I sense that this statistic is relatively the same with most of my New Jersey Divorce Lawyer colleagues. In that 1% of cases, however, divorce arbitration in New Jersey is becoming more preferred to many people, including me, than a traditional trial, for a whole host of reasons -- some of which are discussed in this article, and some of which I will get into in other posts. Mediation and arbitration are known as "alternative dispute resolution" methods. Both are wonderful alternatives to litigation in court that should be considered by anyone going through a divorce.